Roof damage can happen slowly over time or within a matter of minutes when hail or a strong wind event blows through. Whether it is best to repair or replace a damaged roof can be determined by an experienced roofing company, more specifically by a GAF Certified Roofing Contractor like Refuge Roofing & Siding. If storm damage occurs, you will want one of our skilled roofing restoration project managers advocating on your behalf to get everything you deserve from your insurance company. Our roofing repair specialists work with asphalt shingles, architectural style shingles, steel roofing and cedar shake materials. Making your home or business whole again is the ultimate goal of an ethical residential and commercial exterior contractor. A roof that has sustained significant storm damage will most likely have to be replaced by a roofing repair contractor of your choosing. The most commonly used residential roofing material is the 3-tab asphalt shingle. It comes in a wide variety of colors that can compliment just about any home. 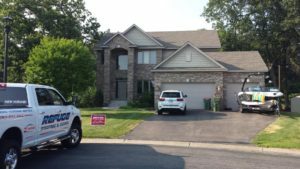 Residential roofing installation experts at Refuge Roofing & Siding can restore every aspect of your roof to be as good as, if not better than when it was new. After roof has been damaged to the point of needing replacement, many homeowners choose to upgrade from their existing asphalt shingles to a higher quality, more durable roofing system. Refuge Roofing & Siding can and will install any type of roofing materials that you prefer. We do however recommend installation of the GAF Timberline roofing system with distinctive, architectural style shingles. The architectural styling adds depth and dimension to the structure’s aesthetic appeal and can add years to the roof’s expected lifetime. A metal roof can be an excellent option when choosing which type of roofing for a residential or commercial building. Although steel roofs are one of the most durable roofing materials on the market, they can be damaged by a tornado, fallen tree or other severe weather event. An experienced, steel roofing repair contractor can fix a damaged section or replace the entire roof when needed. A standing seam metal roof has a raised interlocking seam that adds a nice visual feature to a roofing system that is built to last for several decades. Cedar shake roofing can be absolutely stunning to look at, which is great news considering that a cedar shake roof can last for over 50 years. As with any type of roof, cedar shake roofing can also be damaged by a storm or by neglecting to keep up with recommended maintenance for this style of roof. Fortunately, Refuge Roofing & Siding provides excellent maintenance restoration and repair services for cedar shake shingled roofs. A storm damaged roof can quickly result in interior damages if not repaired quickly and correctly. Only a small percentage of roofing companies are GAF Certified roofing contractors. Refuge Roofing & Siding is proud to be among this elite group of storm damage roof restoration specialists in the area. 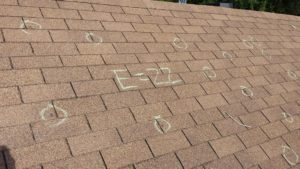 Our team can assess the damages, respond with a desired solution and have your damaged roof repaired in a very professional manner. Contact Refuge Roofing & Siding for a Free – NO Obligation – NO High Pressure Tactics – NO Nonsense – Quote on Roofing Repairs by calling (651) PRO-ROOF or 651-776-7663 Today!